Cazorla’s goal – Arsenal exploit an opportunity on the break, with Gnabry driving inside and finding Cazorla, who is left in space as Walker comes across to cover. He drills a first-time finish across Lloris and into the far corner. As soon as Serge Gnabry receives the ball with his back to our goal, there is an issue here – he’s between the Tottenham midfield and defence, and it’s enough to concern Tim Sherwood, who raises his hands from the edge of the technical area. Personally, I would want to see Chiriches much tighter to Gnabry here. But it’s also interesting to look at the whole view of the pitch from the moment the ball is played to Gnabry. Note the positions of Lennon on the halfway line, Bentaleb, the deepest of our midfield players, and Walker, who had been pretty advanced and is making his way back. The reason I would want Chiriches to be closer to Gnabry is because he has time and space to turn and drive at the defence, and instantly this move become a genuine danger. Walcott makes an intelligent run in behind Chiriches, and Dawson begins to follow him. Gnabry has options because our central defenders allow him to have options. Chiriches pays lip service to coming out to him, whilst Walcott’s run has dragged Dawson away, leaving a huge gap. Because of Dawson’s committing himself, and the mismatch of pace between Dawson and Gnabry, I personally think Kyle Walker has little choice but to focus his intentions on closing this space that he sees Gnabry potentially exploiting. Taking advantage of this, Gnabry shows good intelligence and slips a well-weighted pass into Cazorla’s path. Walker has had to make a decision, and has therefore opted to leave Santi Cazorla. Because Dawson has sold himself, and because Lennon hasn’t tracked back (and he has the pace to have allowed him to do so in this time) Walker’s decision is deemed questionable. But I personally think it’s a call he has to make, and so find it hard to pin the blame entirely on him. But it’s a fantastic first-time finish from Cazorla, who drills his shot across Lloris with Walker throwing himself at the ball. Rosicky’s goal – Danny Rose dallies on the ball, and is pick-pocketed by Rosicky, who runs at Lloris and lifts the ball over him. A Spurs corner breaks down, and the ball comes out to Soldado on the left wing. Rather than lifting the ball into the box, he lays it back to Danny Rose – our deepest player. Rosicky begins to press Rose. Rose could pump this into the box first time on his left, or turn onto his weaker right foot – but has limited options. Essentially if he lets the ball run across his body onto his right foot, his only viable option is to lay the ball back to Lloris, which at 1-0 down on 61 minutes might be seen as negative. So Rose does something foolish – he attempts to turn back onto his left foot, in order to rebuild our attack. But Rosicky is wise to this, and nicks the ball. This gives Rosicky pretty much a free run at goal, with just Kyle Walker able to get anywhere near to him. Walker is unable to make a challenge, though, and as Lloris attempts to narrow the angle, Rosicky expertly lifts the ball over him. Once again, Tim Sherwood has received criticism for his choice of formation, with some fans seeming to take some sort of tactical moral high-ground, as if they think Sherwood didn’t understand the connotations of playing one fewer midfield player than Arsenal. Arsenal are currently the best team in the country (or so the league table suggests), and tend to dominate most teams that come to play at the Emirates. There are typically two ways of trying to play – you can match up to their formation, and play aggressively as Everton did earlier in the season. Everton played probably to their absolute maximum that day, and only came away with a 1-1 draw. Better than we achieved yesterday, certainly, but they had pretty much a full squad to pick from, and were relatively well-rested and fit in comparison. The other option is to attempt to play more attacking players; to soak up the pressure, and to catch Arsenal on the counter using wide players and getting bodies into the box. This is the approach that Sherwood opted for and, whilst there were flaws, I don’t think that the overall Tottenham performance was as bad as the social media response suggests. Arsenal had some chances – of course – but so did we. Both of Arsenal’s goals came from poor errors from our defenders, and although the system arguably caused the first goal, the risky 4-4-2 (if you can call it that), generally held up OK against Arsenal’s 4-2-3-1. This was because it wasn’t a flat 4-4-2, as the below illustrates. Eriksen tucked in, both strikers took turns in dropping off (although clearly Soldado was the one instructed to drop into the hole more often than not), and only the full backs and Aaron Lennon provided width. For me, the formation could have coped and could have produced a result had our players performed better on the day. This seemed to be one game too far, though, for a small group of players (6 games in 17 games with many injuries), and all four of our key attacking players – Adebayor, Soldado, Lennon and Eriksen – were well under-par on the day. Had we had a full squad to pick from over the past fortnight, we might have had a few fresher legs and things might have been different. With Capoue struggling for fitness (Sherwood’s mentioned this twice recently) and having come off against United, Sherwood took a gamble and played 19-year old Nabil Bentaleb. Whilst he had a very tidy game in possession – attempting more passes than any other player on the pitch (82) at a completion rate of 93% – he did make some foolish challenges and was positionally naive at times. He also aggressively stamped on the ground in frustration at the end, dangerously close to Monreal’s fingers. For me, Bentaleb and Dembele should have played a little deeper, given how deep our defence played, and how exposed Chiriches and Dawson were at times against the pace of Arsenal’s attackers. The gap between defence and midfield was too large, and many are justifiably saying that this would not have been the case had Capoue played – he naturally plays a deeper role. “They outnumbered us in the middle of the park, we outnumbered them out wide, you can’t have it all ways – I think we were fine, we didn’t lose the game because we were outnumbered in the middle of the pitch”. As Sherwood suggests, Arsenal were not totally dominating the game or cutting through us at will, and the stats tend to back that up – in fact, they compare favourably with, for example, Borussia Dortmund and Chelsea, who both won at the Emirates early in the season. The key stat, however, was that we didn’t manage to score – for the first time in Sherwood’s reign – and, as I mentioned, I felt that was more down to poor displays from our attackers. The one thing I would say is that Arsenal scored at good times for them, and this allowed them to play within a comfort zone which made them incredibly difficult to break down. If you’re to compete at the Emirates, you simply have to be more resilient, and I can certainly see the argument that the first goal came from a flaw in the system. Was it a risk worth taking? A tricky one to answer, but I can certainly understand Sherwood’s motives. It wasn’t a day for great individual performances, but nor was it the end of the world. We have a week now where we can hopefully get some players back off the treatment table and get the players working together on the training pitch ahead of Crystal Palace’s visit to White Hart Lane next Saturday. As mentioned last week, the good people at Campo Retro have got in touch, and are offering Spurs fans around the world a fantastic opportunity to win a Tottenham Hotspur retro shirt with any name and number on the back. 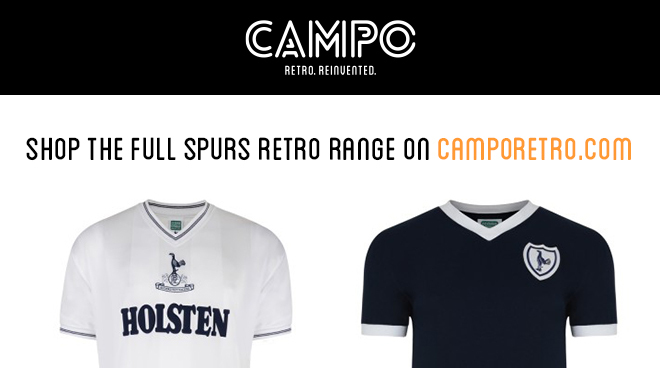 Campo Retro has a wide range of Spurs retro shirts available, with classic shirts and track jackets ranging back from 1962 to 1991. Not only that, but Campo Retro will also print any name and number on the back of the shirt to make it extra special. It’s that simple. The competition closes on 17/01/2014 and the winner will be announced soon after. The winner will receive an email from Campo Retro to request information on shirt size, personalisation and delivery address. All entries will also receive an exclusive discount to use at www.camporetro.com. Sorry, both goals were Rose's fault. In the first - Gnabry is not Chiriches man. He has to follow Walcott. Gnabry has left Rose in no man's land. Dawson & Chiriches have to hold their position and watch Walcott and oncoming runners. Rose should befollowing his man. He doesn't. He was woeful yesterday. He's feasted on his debut goal long enough now, that is obliterated now and he needs to grow a pair. Not good enough for this club! I considered this too - should Rose have done more? Initially, yes, but equally Chiriches is closer and knows he has Rose covering in behind. Tottenham had 10 men out: Vertonghen, Kaboul, Naughton, Townsend, Paulinho, Sandro, Holtby, Sigurdsson, Lamela and Defoe. Thats a whole team (minus keeper) that could have finished top ten in PL. Not forgetting at all - they had serious injury problems. But they are a stable, well-organised unit who know the expectations of the manager. We're learning Sherwood's ways, and to have injuries on top of that makes it very difficult. PS The stats are a smoke screen. Our % possession only grew becasue of the last 16minutes when (a) they had given up attacking and just strolled, and (b) were down to 10 men and yet we still didn't have a decent chance. 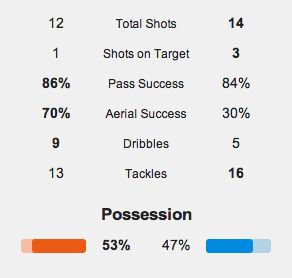 As for our 13 shots, 95% of them were in Row Z. Let's not kid ourselves please. Do take your point, but the last 15 minutes wouldn't swing them *that* far in our favour. 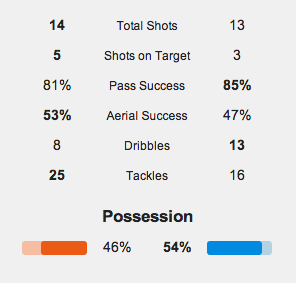 Stats-wise it was close even before the Walcott injury. Before Rose's catastrophic error, we were coming back into it. The most sensible analysis I have read among a sea of ignorant drivel. I despair of some of our 'fans' at times. Some seem to think we have a divine right to win every game. We were not humiliated. Just be thankful we are not Hammers fans! Agree...we did ok, with what we had, although I felt our attack was, overall, poor and spent too much time in questionable areas of the pitch (Adebayor) which gave them even more time. I agree, actually. Felt both stikers were poor - don't know why Adebayor was the one leading the line with Soldado dropping - it should have been the other way around. Perhaps Soldado's injury played a part? It feels like a lot of our fans are losing the plot at the moment, doesn't it? I agree. Arsenal know what's expected of them - Spurs don't quite, yet, and especially with so much chopping and changing through injury and lack of time on the training pitch. I totally agree with your positive slant on the game. It was unrealistic to expect too much from the game at this time. I also agree that Walker was not particularly at fault for the first goal. Unfortunately, he is having to take far too much responsibility at the moment. It is also clear that Dawson's alarming lack of pace and dubious judgement is putting pressure on Chiriches and Walker and pulling them out of position. However, it is also true that Rose was terrible in both defence and attack yesterday and I remain unconvinced about his long term potential at left back. As a previous comment has indicated, it is clear from your photos that he didn't do enough during the build up to the first goal. I would still love to see a new left back and centre back, both with premiership experience, come in during January and ideally a back-up striker. I can't argue with any of that! Very logical conclusions. I'm not sure why so much faith has been put in Rose, he needs to earn it with much better performances. Why is Sherwood not recalling Benny?! Get the impression that Benny did *something* to upset people. Great analysis windy. A lot of fans need to stop freaking out all the time. It wasn't that bad a game and they all just looked tired. Is Holtby injured btw? I really like the guy and hope tim rates him too. It would have been a great time for holtbys endless energy. Anyway, if spurs had to lose a match over the holidays this is the one i'd have picked. A new above average sfriker, a new cb, and a second Lb and we'll be sorted. Calm heads required from fans *and* players! 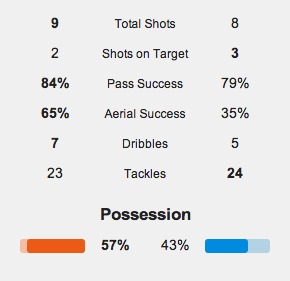 tottenham outshot/possessed arsenal because of score effects. basically when a team goes behind it tends to outshoot but not outscore it's opposition - simply because the opposition will play more cautiously/ drop deeper to deny good opportunities while slightly/significantly curbing their own attacking threat. This was evidenced on the field, Eriksen's wide angled shot was tottenham's best opportunity of the game, and became before they went behind (this chance was also overstated - generally shots from an angle like that are a lot harder to finish than people think). A poorly hit Adebayor volley was the only other realistic goal scoring opportunity Tottenham created despite chasing a lead. That's why both Chelsea and Dortmund's numbers are much more impressive - Dortmund led for ~45 minutes, Chelsea led for ~70, and yet they still outshot Arsenal. It's also why Tottenham posted seemingly decent shots/possession numbers in the 6-0 thrashing against Manchester City, despite their clearly being only one team in that game. City got an early lead, then picked Spurs off with direct counterattacks, while Tottenham were restricted to one decent chance and took those low quality shots City afforded them. I do agree. I was mostly trying to point out that the many fans claiming that we were *utterly* outplayed were wrong. First, kudos for the work you put into the blog. Wish more blogs did it, even if they focus on Spurs. That said, your best chance was a defensive mistake by Arsenal, and Eriksen did not punish them for it. As for shots taken, suggest you analyze when they were taken, and from where. Soldado's two misses were a poignant reminder of the threat you had last year, who is gone. And not replaced. This was just the kind of match that Bale would have salvaged something from. If Spurs want to progress, you need to look at goal difference, because you are always woefully lacking in that. Fair points, very fair in fact. Well said Windy. We also were playing away from home against the team with the best defensive record. Which ever manager was there yesterday, we still would not have one with all the injuries as well. Always hate to loose to them but was not overly embarrassed by the way we played. We were awful throughout the game with no threat. Sherwood is clueless and will be gone in May. He'll be happy with Coventry at home in the 4th round and will be able to go watch it. After all he "wasn't too despondent" after the defeat. You could be right, but might as well give him the benefit of the doubt for now, no? Much as I admire your blog, I do wonder whether you are biased by Sherwood's work with the development squad and promotion of some of that squad. We were wide open in the middle just like we used to be under Redknapp. Some of his press conference was just gobbledygook and the press know it. Some will be after him, mark my words. It wasn't exactly grown-up, intelligent football. Can you imagine Chelsea playing like that? We've had grown up, intelligent football for much of the season though, mate, and that hasn't gone so well. TBH I think the players need a bit of a more simplistic tone - at least short term. Sherwood's more "straightforward" tactics and communication might suit this group of players better than AVB's more complex methods. Is that because our players are a bit thick (only kidding)? Or is it the nature of the football in the EPL that doesn't allow for intelligent football? I'll be interested to see what happens in the next match given that Sherwood has had some of the time that he wanted. It's against a Pulis team and so they will be well-drilled. I'll also be interested to see how TS approaches the Europa League. This is really good again Windy. I agreed with Sherwood's comments on transitions of play. I think the main problem was the link between the midfield and the forwards and the link between the midfield and defence (as you've pointed out). It didn't seem like a cohesive unit. But saying that, I don't think we had the personnel to really be that dynamic in the middle especially. Had Paulinho been fit, I think this could've been a very different game. Again, Bentaleb looked very calm for such a big game. Currently, he is doing a job similar to what Livermore did for us but do you think more quality than him? Obviously his role hasn't really allowed him to open up his play yet. I'm not sure if Capoue would've made too much of a difference instead. He seems quite cumbersome and I think someone more nimble with a bit more energy and bite would have always been more suited to combat their pacey midfield. I think we coped well despite the numerical disadvantage in that part of the pitch. I genuinely didn't think we were outrun. Like you said, lapses at the back cost us. I think the key to the game was denying Adebayor the chance to retrieve the ball from deeper positions. Initially I thought he wasn't coming back enough, but I think they put the squeeze on him really effectively. He seemed to have 2 or 3 men on him every time he was close to the ball or even when we regained possession. That in turn limited Soldado's effect. 1) To link up with him. 2) To push their line up and play both strikers offside for balls from wider positions. Eventually this just strangled us and our ability to create substantial opportunities. Fair play to Wenger in my opinion. He has shown some astute tactical nous this season after a few seasons of indifference. As much as it pains me to say it.